I am the type of person who rips out the ads (not the articles) in a magazine to save them for later. I think a lot about what makes great advertising, and in my opinion the Patek Philippe watch advertisements are among the greatest of the century. 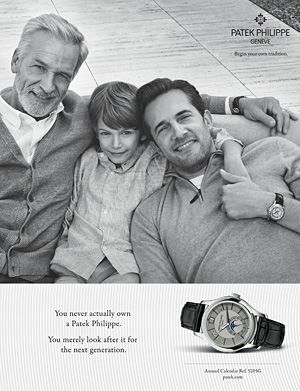 “You never actually own a Patek Philippe. You merely look after it for the next generation." With that simple turn of phrase, a commoditized product (a time-keeping device no more accurate than the phone in your pocket) is transformed into a treasured heirloom that passes along value and tradition from father to son, or mother to daughter. The message is simple, clear and powerful.